Like a man who loves throwing acid on his own face I saw this meme and I just had to respond. Playing the part of fool I took the bate and a rather one sided theological bloviation ensued the likes of which I have not had for a year or so. I wanted to say something along the lines of “that’s not a fair representation of something called meticulous providence.” I was told that a person who believes in this type of teaching is actually following Allah of Islam. Like using a roller brush to restore the chipped paint on my Micro-machines collection I was meticulously taken to school on how un-meticulous God has to be in His providence in order for him to be good. “To a guy with a hammer everything’s a nail”, right? Well, I had found myself to be the nail in a room full of hammers. 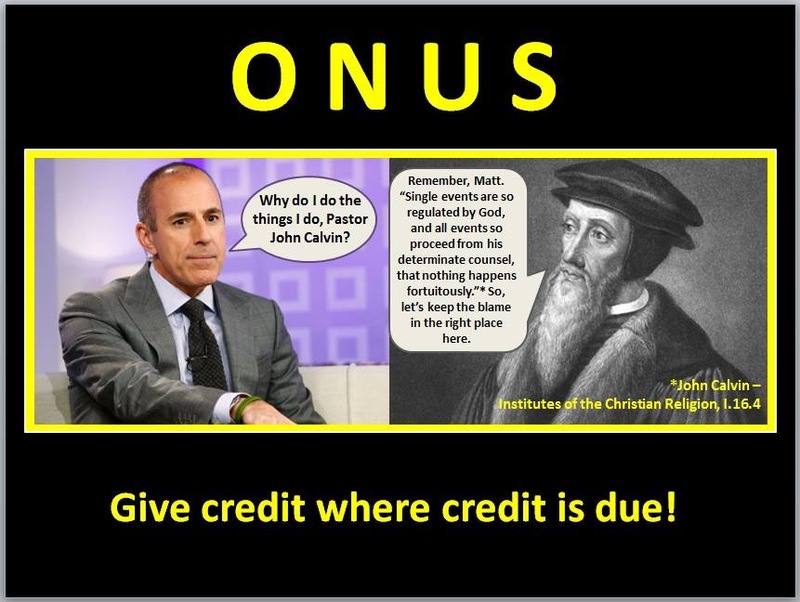 Like some kind of Quentin Terrintio movie involving an anti Calvin theological tag team of wack-a-mole champions of free will I would pop my head up with a comment intending to encourage something along the lines of nuance and WAM!…WAM! I find myself at the wrong end of a theologically bludgeoning. Feeling as out of place as Rambo at a Mennonite peace conference I endured comments suggesting I believed in a Muslim theological system along with not so subtle reminders that Jesus is not Muslim. Why? Because I needed it I guess. Don’t tell my congregation. It was bad enough that I began to laugh. It was actually super funny. By the end it was clear that Satan and Muslims would agree with me if I agreed with Calvin. I think if the discussion type thing we were having would have gone on any longer it might have actually resorted to repeated admonitions against reading anything Calvin said in context about anything if I wanted to get to heaven. But in all honesty i should note that there was a really kind gesture at the end when one of the folks assured me that when I get a little more mature I’ll see things differently. I think I was supposed to be super thankful by this condescending jesture in the same way a person begging for money should be thankful when a wealthy person rolls down thier car window like an inch and offers a couple bucks. It was at that moment I realized that I had actually never met or read a mature Christian that believed in meticulous providence (insert sarcasm). So what is providence? Biblically speaking, providence has to do with the nature of God’s ability to control and provide for his creation. First, a biblical informed understanding of providence relates in a way to Carrie Underwood’s cry “ Jesus take the wheel”. During Catechism class I found this song seems to move the youth in my class. They identify with it in a way I don’t. None the less this song is a cry from someone who feels out of control and wants to give control to God. As the song implies control in responsible hands is a good thing. Providence in Scripture addresses the subject of God’s ability to control (even guide) his creation. The providence of God as seen in Scripture always has a natural (as in nature), historical and personal (as in individual) nature. It is impossible to separate the relationship of these three contexts share. Second, providence also addresses the subject of God’s ability to provide for his all of his creation in a natural, historical and personal sense. Meticulous is a word used by some folks (like me) to describe the detail by which God’s providence appears to be on display in the story of Scripture. I believe that God’s control and provision (down to finest detail) is mysteriously, individually, naturally and historically displayed in Scripture for three particular reasons (just to name a few). My Facebook experience yesterday reminded me of how much comfort a Biblical understanding of God’s provision and control has brought to my life. “”Father?, “Yes, my son?” Abraham replied. “The fire and wood are here,” Isaac said, but where is the lamb for the burnt offering?” Abraham answered “God himself will provide the lamb for the burnt offering, my son.” And the two of them went together. After yesterday’s Facebook conversation I am keenly aware that this might be dismissed as a Muslim passage by some of my Christian brothers and sisters so if you are still reading bear with me. Abraham has faith that God is meticulous in his provision. Abraham cannot see into the future but he see’s into the heart of God which is a much better resting place for our faith. Abraham’s belief that God would work out the details is on display here. If I believe that I need to do my best and that God will work out the details I believe in meticulous providence. Second, meticulous providence is how God frees his children from a life of religious horror filled superstition. Superstition terrified the culture of Calvin’s day. Anyplace of ignorance in the lives of the people that filled the church in those days was filled with superstition. It was no joke, it wasn’t cute. People lived in terror in their ignorance of God’s meticulous providence. Horror, back then, was not synonymous with a movie you take your girlfriend to for a good jump-scare. Reformation era folks where living on a real horror movie filled with superstition brought about and leveraged in large part by the Roman Catholic Church (no offense to my RC friends) in those days. The church should have been casting the light of God’s providence upon his children but they did not. Calvin, Luther etc were very aware of this. They did not want the children of God to be ignorant of God’s providence in the midst of their meticulous superstitions. For the first time in a long time the lives of the common humble folk were being comforted by the meticulous providence found within the Scripture being taught in their own language.. Perhaps (during this time) the religious gate keepers where out of touch with the seemingly insignificant darkness and fear of the illiterate fools beneath them lived in? Perhaps it was within the best interests of the brick and mortar power brokers of the Church to leverage ignorance and fear? The best way to keep the people dependent on religious thuggery was to avoid keeping the common folk from seeing how meticulous God’s providence actually was. The humble, poor and needy children of God might become a bit demanding if they were able to compare the providence of God to that of his church in those days. 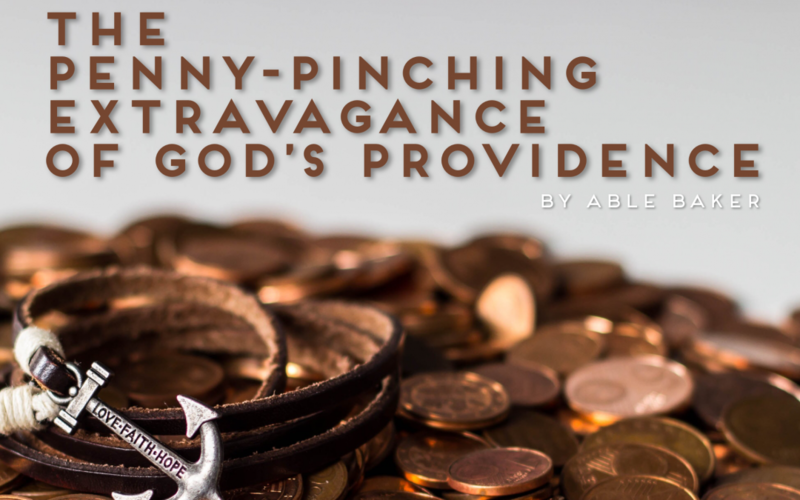 Third, the providence of God is both penny pinching and extravagant at the same time. One of the blessings of the gift of faith is the new eyes the children of God gain. New sight. Like Abraham’s insight into the meticulous providence of God the children of God have access to a new perspective. Those who walk by faith can certainly experience this meticulous provision, control and guidance of God as they learn to live in the newness of life brought by the Spirit. Do you feel so insignificant that you are just another face in the crowd? Look at what Paul says. Extravagant is a cool word. It comes from the Latin word extra “outside of” and vagaries “wander, roam”. It is used to express a sense of extreme excess, or exceeding reasonable limits. It’s easy for me to imagine that God is extravagant but not an extravagant penny-pincher. Consider the sage insight of my mom here for some clarity as to what I’m saying. She would remind me how often I’ll find that the most wealthy people have an incredible sense of value for a dollar. It might be difficult to imagine an extravagant God being meticulous in his providence but its not hard to imagine that a rich man might just be wealthy because of his big appreciation for something as small as a penny. Paul is reminding those of us who might see ourselves as mere pennies at the foot of a rich man’s extravagance that God is a penny pincher. Those that know God’s love have a strong sense of it’s extravagance when they consider his Love for the World (John 3:16) but how blessed are we to see that Gods penny-pinching loving kindness and provision extends all the way down to individual pennies like me? How particular and minuscule is his love? Look at the testimony of Jabez (1 Chronicles 2:55), listen to the praises of Hannah (1 Samuel 2) and Mary (Luke 1). Do you see how something as insignificant in our culture as a human fetus leaps in Elizabeths womb at the presence of pregnant Mary? Mary, Rahab, Hannah, Ruth, Jabez, (I could go on and on) lets just call them the poor and needy… who are they? Examples of God’s meticulous providence. Where others see pennies God see’s something of value meticulously so. Their stories all point to an extravagant penny-pinching kind of providence. What kind of mind would limit the scope of God’s providence? Usually a person who has inherited a fortune earned by someone else has poor sense of what it takes to keep a fortune. They do not yet posses something that is thier own. Perhaps they have a poor understanding of the value of a dollar. Not in every case of course but I would imagine a mind that would see the meticulous providence of God as an evil or worthless doctrine has likely never lived in poverty only to find out that God knows thier name. As God did not at first choose you because you were high, He will not now forsake you because you are low.